If you already created games with buildbox, you maybe don't want to open eclipse each time you want to build your Android APK. or you just don't like eclipse and don't want to install it. if this is your case, this article may interest you. This is the first article of "Buildbox like a boss" serie, so let me know what do you think about it, and how I can enhance it. Checking and fixing the environment. if you get an error saying that he command is not recognized it means that android SDK is not correctly installed, you need to install it. now just to make sure that everything is fine, type the following command . if you get a message saying that the command is not recognized, you should install ANT. if your environment is correctly configured you can move to the next step. Now we'll create a script to automate the APK creation, then we'll add it to windows explorer context menu to make it easier to use. (MyGame is the folder containing a subfolder called android). this will build and install the game into the attached device. 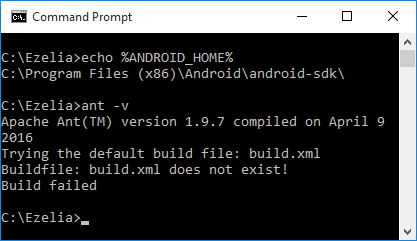 Shell extensions will add Explorer right click menu entries to make apk creation easier inside c:\bbscripts folder create a file called apkbuild-install.reg and edit it with the following content. Windows Registry Editor Version 5.00 [HKEY_CLASSES_ROOT\Directory\shell\BBBuilder] "Subcommands"="" [HKEY_CLASSES_ROOT\Directory\shell\BBBuilder\Shell\APKBuild] "MUIVerb"="Build Debug APK" [HKEY_CLASSES_ROOT\Directory\shell\BBBuilder\Shell\APKBuild\command] @="\"C:\\bbscripts\\apkbuild.bat\" \"%1\" debug"
Double click on apkbuild-install.reg, you'll be prompted to accept changes made to windows registry, Accept them. 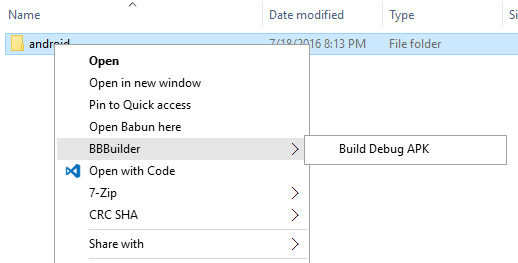 this will add an entry called "BBBuilder" to explorer right click menu. this will run the script we created before and will build and install the APK in the attached device. if you don't like the shell extension and prefer using command line only, you can remove it at any time by double clicking apkbuild-uninstall.reg .